This year’s U.S. Dramatic category sees a filmmaker moving up the Sundance ranks—Justin Chon, who directed the tight-fisted, black-and-white LA Riots drama “Gook” (which played the festival’s NEXT section in 2016), now has a film in the so-called main competition program. With this family study, co-written by Chris Dinh, Chon continues to be an exciting but flawed filmmaker, sometimes struggling to balance his desire for both revelatory intensity and tenderness. Steered by an introspective and emotional performance from Tiffany Chu, “Ms. Purple” tells of a sister (Chu’s Kasie) and her estranged brother Carey (Teddy Lee) in Los Angeles who have to take care of their dying, bed-ridden father. Their mother has been long gone, as flashbacks indicate. Kasie refuses to put their father in hospice care, and helps pay for the health expenses by being a host in karaoke rooms for rich, often obnoxious men. This latter story detail is the way Chon initially brings us into Kasie’s world, showing us the ranges of masculinity with which she interacts, a long time removed from the days when she was called beautiful by her father as a little girl. Chon’s camera has a great affection for Chu, and it paints a holistic image of her, mourning the many instances in which the world has broken her heart. Having more than a couple things in common with last Sundance’s family dramedy “What They Had,” the movie gets its greatest strength out of watching these siblings quietly bond after so many years, finding some type of peace within themselves and also their relationship with their dying father. It also has some unexpected comedy, like when Carey wheels his father out into the Los Angeles to the tune of “500 Miles.” In one of the story’s more delicate touches, it becomes apparent that these trips outside are more for the son than the father, the former trying to silently connect with someone that he left long ago. But Chon remains an inconsistent dramatist, overbaking some of his most important moments for the sake of making his emotional beats unmistakable. Characters have explosive interactions that go from zero to ten instantly in terms of seriousness, the dialogue hitting right on the nose. It all risks cheapening the fictional beings that he continues to make fascinating as the story goes along, corroding their liveliness. But while nuance can sometimes be absent, especially with a selection of instrumental pieces that demand your emotions, Chon has an eloquence with scenes of spare dialogue, as with the framing storytelling device and flashback, of Kasie and Carey as young kids observe their father affected by the abandonment by their mother. It’s often the moments in between Chon’s loudest notes that make the best impression in “Ms. Purple,” a striking character study on the responsibilities of family, and the importance of sticking around. 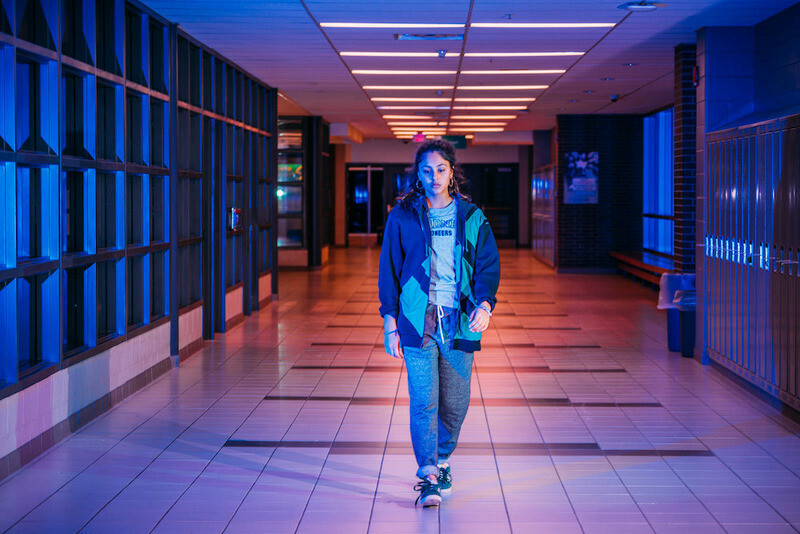 Shot in Chicago, “Hala” is a coming-of-age story with inconsistent storytelling but a strong lead performance from Geraldine Viswanathan. 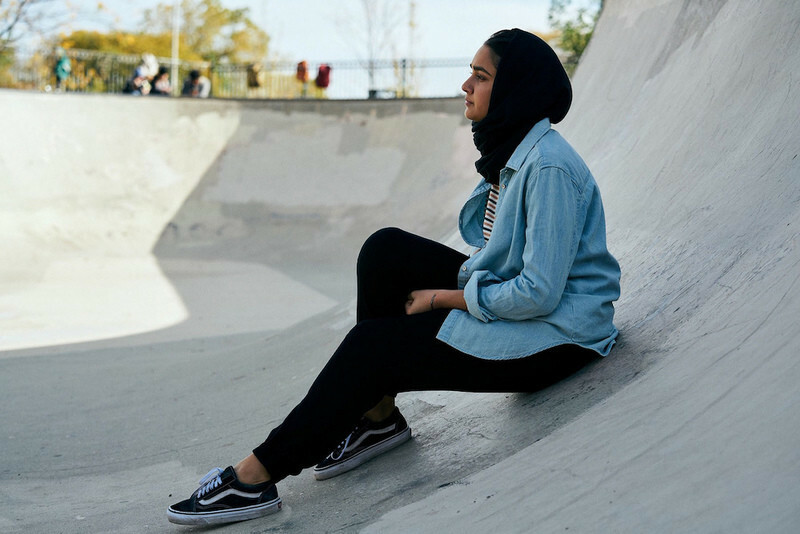 Written and directed by Minhal Baig, it tells of a skateboarding, crossword-solving Muslim high schooler dealing with life-changing concepts. First, her parents Eram (Purbi Joshi) and Zahid (Azad Khan) may not have the happy marriage that she thought they did. And then there’s Jesse (Jack Kilmer), a classmate who causes her to challenge her conservative Muslim upbringing. Baig’s script is largely driven by dialogue, which is not a problem so much as it plays out like a storytelling crutch. One of its earnest storytelling devices is a “What is your point of view?” essay assignment that Hala receives in English class, and the movie can’t build beyond this cliche to make it interesting. The same flagging dramatic tactics pop up in scenes where Hala learns more about her parents’ history of romance (and arranged marriage) through expository dialogue. While told with delicacy that can sometimes feel too loose, “Hala” is able to articulate much its inner conflict with an exceptional and largely contemplative performance from Geraldine Viswanathan. Watching her skateboard with ease, or wonder what she wants for herself, can prove to be the most engaging emotional spectacle of her story. She is a fully-formed character, like Antoine Doinel or Lady Bird before her, and this story feels like just the beginning. Writer/director Pippa Bianco’s “Share” is a very straight-forward observation of a high school nightmare: Mandy (Rhianne Barreto) has been assaulted at a party, and though there’s footage of it that gets texted around by her classmates, no one knows who did it. She doesn’t remember what happened, and no one is coming forward. Bianco’s script, based on her 2015 short film, takes an almost too-procedural angle on the process, starting with Mandy being asleep on the lawn, and then plunging into shame and anxiety when the video comes out, and removing herself from her social life while taking therapy. The aftermath affects her social life, including with the boys who may or may not have had something to do with the incident, isolating her from the world. Given so much pain to carry in each scene and often with little dialogue, Barreto vividly captures the tragedy of someone who has been so affected. Her parents, (played by Poorna Jagannathan and J.C. Mackenzie), are out for answers: They collectively offer a visceral idea to the anxiety experienced by a family changed by this incident, especially as the victim and their parents diverge on what they consider to be closure. While the scenes of watching Mandy wrap her head around what has happened are assuredly effective, it is almost just as hard to see the parents seek a type of justice. These characters also take the story in a more compelling direction, as Bianco’s script spends a lot of its time in the grayness of Mandy’s day-to-day life, its developments about the case feeling more matter-of-fact than wholly compelling drama. There is a quiet ambition to this movie—to not be a character study so much as a study of headspace, locking viewers into the day-by-day moment of a young woman dealing with the aftermath of her assault. We are supposed to share her frustration in not remembering, to space out with her as she monotonously plays a racing game, to feel like we always see the green and blue that she stares at with a device in her light therapy sessions. This makes for many pained sequences, especially as it becomes apparent what resolve will and will not reach her, and the story echoes numerous true examples of these similar events in high schools. The complete seriousness of this movie indirectly makes clear what “Share” won’t do, which is add any air to its concrete sadness. If it's true that there's no great drama without comedy and vice versa, "Share" is ineffectively defiant against such a balance. With its hazy cinematography and sparse yet mournful score, “Share” risks becoming a total dirge, but is enlivened in large part by the honesty within its lead performances. It proves to be as much of a tribute to those who have experienced this story in real life, as it is a documentation of what could happen if such a disturbing life-changing event came into a parent's or student’s home.